Neptune, being half again as far from the Sun as Uranus, is a more challenging target. 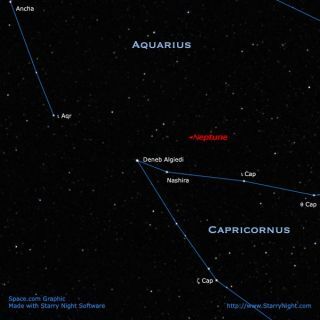 Mid-northern observers can find it by looking towards Capricornus in the south late on October evenings. Medium-sized telescopes should be able to resolve the tiny blue disc that is slightly brighter than 8th magnitude and about two-thirds the diameter of Uranus as seen from Earth. Last week we looked at the planet Uranus. Interestingly, thediscovery of that planet in 1781 eventually led to the discovery of yet anothernew world, some 65 years later. Since it appeared bluish in color, the newplanet was named Neptune after the god of the sea. But in contrast to Uranus, which is right on the thresholdof naked-eyevisibility, Neptune is much too faint to be perceived without any opticalaid. It is slightly smaller than Uranus, with a diameter of 30,800 miles(49,600 kilometers), and it currently lies at a distance of 2.74 billion miles(4.41 billion kilometers) from Earth. Nonetheless, if you have access to a dark, clear sky andcarefully examine our map, you should have no trouble in finding it with a goodpair of binoculars. Neptune is now among the stars of Capricornus, but with atelescope, trying to resolve Neptune into a disk will be more difficult than itis with Uranus. You're going to need at least a four-inch telescope with amagnification of no less than 200 power just to turn Neptune into a tiny bluishdot of light. Voyager 2 passed Neptune in 1989 and showed it to possess adeep blue atmosphere, with rapidly moving wisps of white clouds. Also evidentwas a Great Dark Spot, rather similar in nature to Jupiter's famous GreatRed Spot. Recent observations of Neptune using the Hubble SpaceTelescope suggest that the Dark Spot seen by Voyager 2 has dissipated, yet ithas apparently been replaced by another. The atmosphere of Neptune isapparently composed chiefly of hydrocarbon compounds. Based on the rotationrate of its magnetic field, a rotation rate of 16.1 hours has been assigned to Neptune. Voyager 2 also revealed the existence of at least three rings around Neptune, composed of very fine particles. Neptune has thirteen moons, one of which, Triton,has a tenuous atmosphere of nitrogen. At nearly 1,700 miles in diameter, it islarger than Pluto. Because it is moving in a retrograde (backward) orbit, therehas been some suggestion that Neptune may actually have captured it in thedistant past. Those who have access to a telescope of 12 inches or more mighteven be able to get a glimpse of Triton, very close to Neptune itself. Neptune's discovery came about from long-term observationsof Uranus. It seemed to astronomers that some unknown body was somehowperturbing Uranus' orbit. In 1846, two astronomers, Urbain J.J. Leverrier(1811-1877) of France and John Couch Adams (1819-1892) of England, were independently working on this problem. Neither knew what the other was doing, but ultimately, bothmen had figured out the probable path of the supposed object that wasdisturbing the orbit of Uranus. Both believed that the unseen body was then inthe constellation of Aquarius, the Water Carrier. Adams was a student at Cambridge University, England and he sent his results to Sir George Airy (1801-1892), theAstronomer Royal, with specific instructions on where to look for it. For someunknown reason Airy delayed a year before starting the search. In the meantime,Leverrier wrote to the Berlin Observatory requesting that they search in theplace his directed. Johann Galle and Heinrich d'Arrest at Berlin did exactly asinstructed and found the new planet in less than an hour. In the year 2010, Neptune will have completed one full trip around the Sun since its discovery. A strange fact about Neptune is that it was very nearlydiscovered by none other than Galileo with his crude telescope more thantwo-and-a-half centuries earlier. It was while observing Jupiter and its system of four largesatellites on Dec. 28, 1612 that, in the same field of view, Galileounknowingly recorded Neptune as an eighth magnitude star. Just over one monthlater on Jan. 27, 1613, Galileo recorded two stars in his telescope field, oneof which was Neptune. The next night when he looked again, he noted that thetwo stars seemed further apart. If he had only continued to keep watch in thefollowing nights he would have almost certainly would have realized that one ofthe 'stars' was indeed moving. But Galileo should not be faulted for not recognizing Neptune, for later observers too, stumbled across it without realizing what it really was.Among them was the skilled French astronomer, Lalande (1795); the Englishastronomer, John Herschel (1830); and the Scottish astronomer, Von Lamont, justdays before Neptune was actually discovered in 1846. All thought it was nothingmore than an ordinary star. And yet, if only Galileo had followed through with hisobservations, the eighth planet would have been discovered before the seventh!